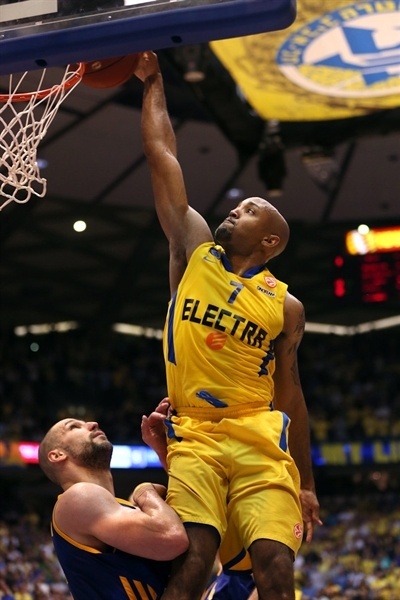 Ricky Hickman scored 14 fourth-quarter points as Maccabi Electra downed BC Khimki Moscow Region 80-79 on Thursday night at Nokia Arena in Tel Aviv, Israel, for its fourth straight win. 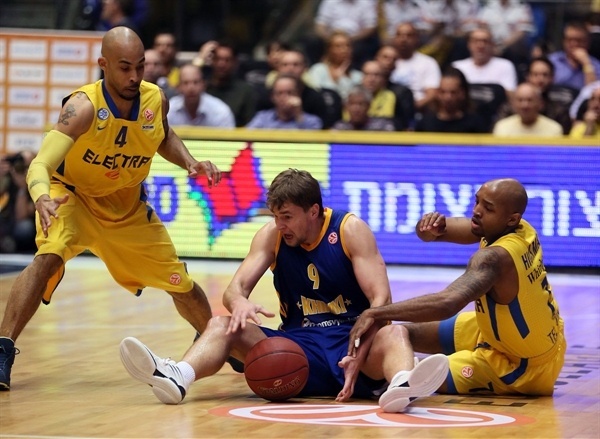 After claiming the win in a thriller that featured eight lead changes and two ties in the fourth quarter alone, Maccabi improved to 6-5, the same record as Khimki and Caja Laboral. All three are only one win behind Olympiacos Piraeus and Montepaschi Siena in second. The game was close throughout. A brilliant Zoran Planinic helped the visitors to a 36-40 halftime lead, but Maccabi stormed ahead by 12 in the third quarter. Khimki rallied back to create an exciting finish, in which Hickman took his chance to shine and led the Israeli champs to an important win. Hickman finished with 30 points, Devin Smith added 16 and 7 rebounds and Shawn James, who played in foul trouble much of the night, finished with 9 points and 5 blocked shots. Vitaly Fridzon led Khimki with 16 points on 4-of-5 three-point shooting, Zoran Planinic amassed 13 points and 9 assists, Paul Davis had 13 points and 9 rebounds, K.C. Rivers scored 11 and James Augustine had 10 points and 9 boards in defeat. Zoran Planinic used his size from the start with a turn-around jumper for the game’s first points. 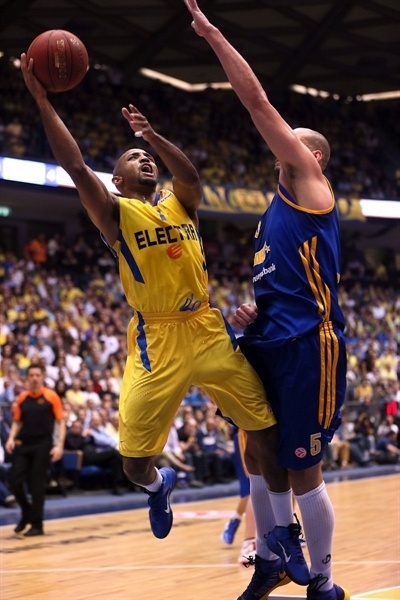 Lior Eliyahu found a cutting Ricky Hickman for the home team’s first basket. 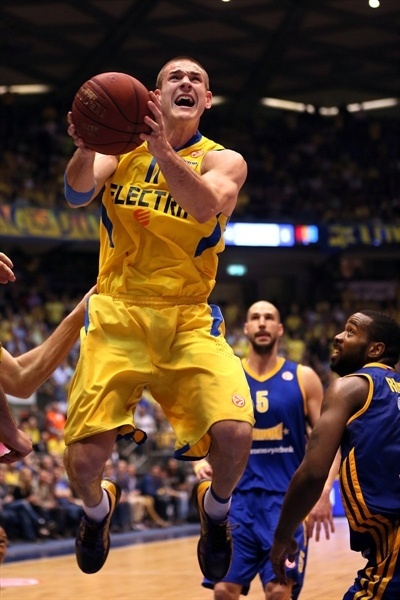 Egor Vyaltsev sank the game’s first triple, but Maccabi answered to stay close. Zoran Planinic notched his third assists on as many possessions to James Augustine for a slam and foul and a 5-10 lead. 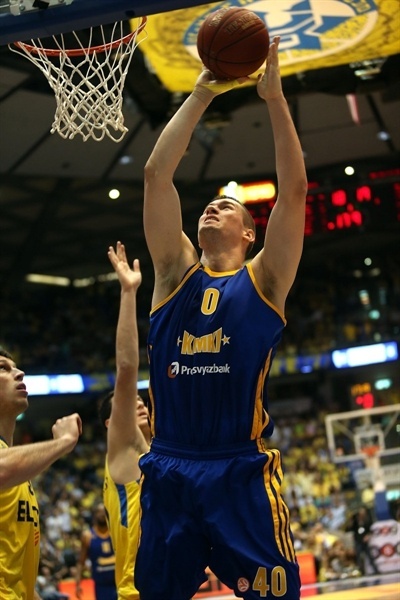 Kresimir Loncar knocked down a baseline jumper before Hickman connected from downtown to end a 1-8 Khimki run. Devin Smith and Vyaltsev traded jumpers as the visitors remained ahead. After a timeout, Maccabi found its footing as Hickman converted a three-point play and Shawn James contributed 4 blocked shots and an alley-oop layin for Maccabi’s first lead, 17-16. On the ensuing play, Zoran Planinic fed Paul Davis for a slam, but James had the last word to make it 19-18 through 10 minutes. 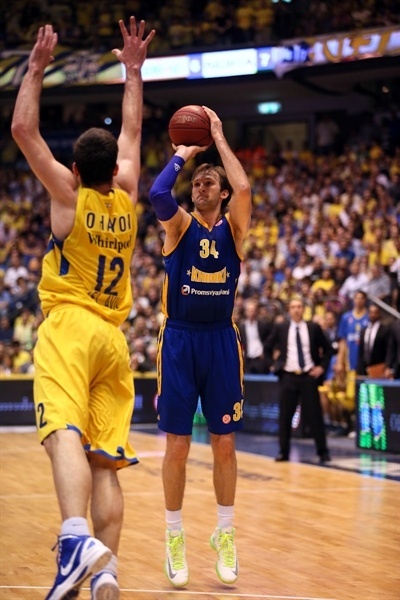 Khimki regained the lead through baskets by Davis and Zoran Planinic, but it was short lived. A Khimki turnover led to a David Logan slam and a 23-22 home team advantage. After Davis’s offensive rebound led to a Sergey Monya triple, Smith tied the game from the line. A Guy Pnini three edged Maccabi in front. The lead continued to change hands on baskets by Zoran Planinic and Smith. After a Zoran Planinic three and James free throws, it was all square, 32-32. 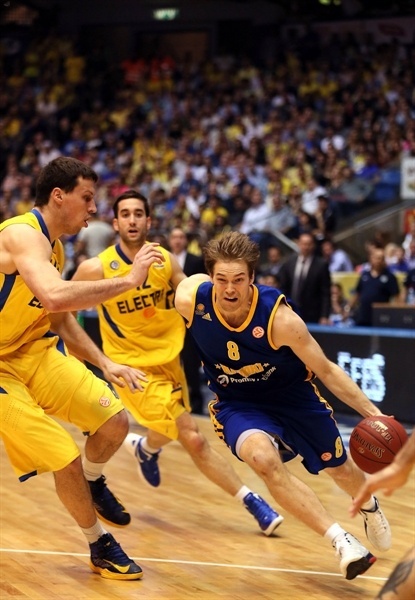 But James soon took a seat with 3 fouls and Fridzon put Khimki back in front with a three-pointer. Augustine added a hook and later a free throw. Hickman scored twice and Eliyahu’s layup was ruled to be after the buzzer to leave it at 36-40 at halftime. 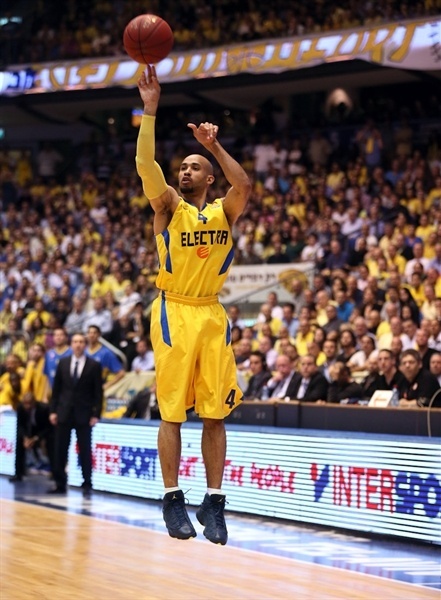 After a sweet move from Smith and an Ohayon triple, Maccabi moved in front again. Baskets in the paint by Loncar and James saw the lead move back and forth. However James took a seat just three minutes into the third quarter with his fourth foul. Hickman extended the Maccabi lead to 45-42 from the line. Loncar scored inside, but then he too committed a fourth foul and stepped out. Smith scored twice – once on the offensive glass and then with a nifty drive – to put the hosts up 49-44. Darko Planinic added a follow-basket before Khimki called timeout down 7. The momentum remained squarely with the hosts as reserve point guard Moran Roth came up with a pair of steals, which led to free throws for Nik Caner-Medley and Roth and a 10-point lead. 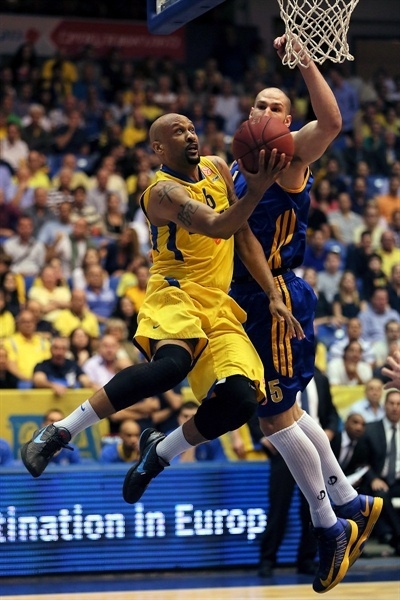 Augustine ended a Khimki drought with a tip-in, but Hickman beat the 24-second clock buzzer. Davis scored inside for the visitors, but Nokia Arena erupted after a Logan three, 60-48. Khimki regained its footing on back-to-back threes from K.C. Rivers and Fridzon. A pair of free throws by Fridzon closed the gap to 60-56 through three quarters. A reverse layup by Davis completed a 0-10 Khimki run. Caner-Medley sank an important jumper, but Rivers drilled a triple to make it a 1-point game. A backdoor cut from Fridzon and perfectly placed pass from Augustine put Khimki ahead, 62-63. Hickman tied the score and put Maccabi in front from the line. Fridzon and Hickman traded big threes. Twice! Caner-Medley lifted the hosts to a 3-point edge; Augustine’s tip-in made it 72-71. Loncar put the visitors ahead with a hook shot; Hickman was fouled shooting a three, but made only 1 to tie it at 73-73 with two and a half minutes remaining. A long step-back jumper by Logan put Maccabi ahead. Smith stole the ball from Planinic with just under a minute to go. After a timeout, Hickman blew past Zoran Planinic for a thunderous slam with 38.7 seconds left to make it 77-73. A costly turnover by Zoran Planinic led to 2 more Hickman free throws with 11.3 seconds left to ice the win. Rivers gave Khimki hope with a triple, but Hickman kept it a two-possession game from the line and despite a Davis triple, the victory stayed with Maccabi. "In the pregame press conference, I said that players needed to be ready to die on the court, symbolically. Moran Roth, Nik Caner-Medley and Darko Planinic died on the court tonight and brought us this victory. After our losses in the first half of the Top 16, I said it was painful, but we still weren’t out of the race. Now after winning five out of six games, I say we’re not there yet. We are far from there, even very far." "We didn’t take our normal shots. We settled for outside shots. It’s not a tragedy and not a disaster. We believe that with two more wins, we can advance to the next stage. 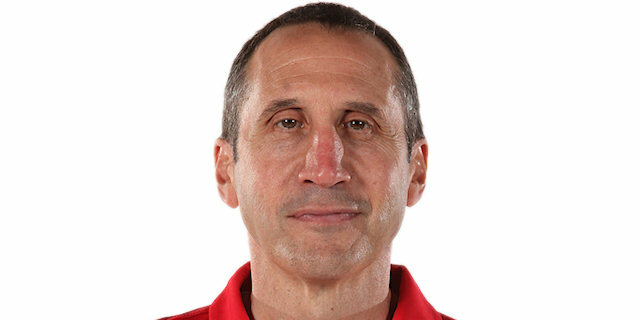 I must congratulate Maccabi and Coach Blatt on their game today. " 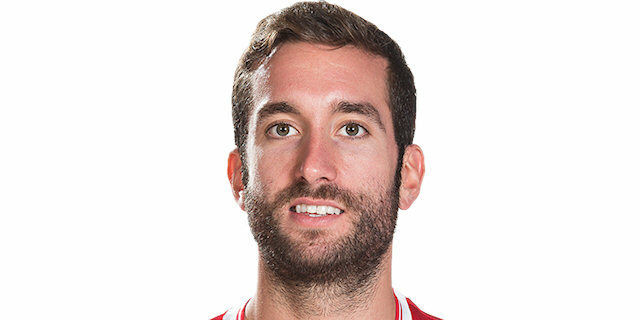 "From the start our goal was clear and it was to win. From the beginning we were first to every ball. [Zoran] Planinic caused us a lot of trouble; they are an amazing team with an amazing roster. 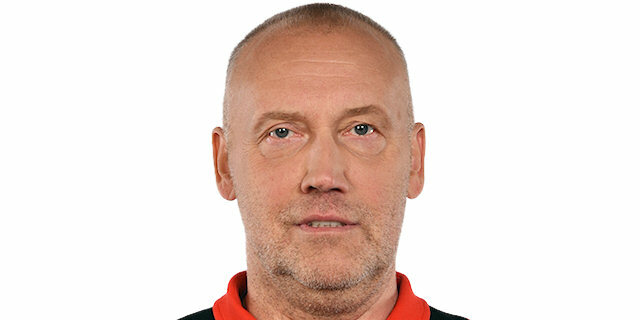 If Khimki’s not the best, it’s the second best as far as its roster in the Euroleague. Today we showed character and how good we can be when we want to be."